Here’s a little of the backstory: two men Kim Young-soo and Han Gi-tak, an assistant manager at a departmental store and restaurant owner respectively, die unexpectedly and later jump off onboard a train headed for Heaven to embark on a path of redemption and newfound love as they try to discover the truth behind their deaths. Firstly, these are some reasons why and how Please Come Back, Mister found its way to my heart. This is definitely Rain’s better dramas since his military comeback, and I am so glad that he picked this project. He seldom does dramas, and it’s great that that he made a good choice this time. (She’s So Lovable was unfortunately, meh.) 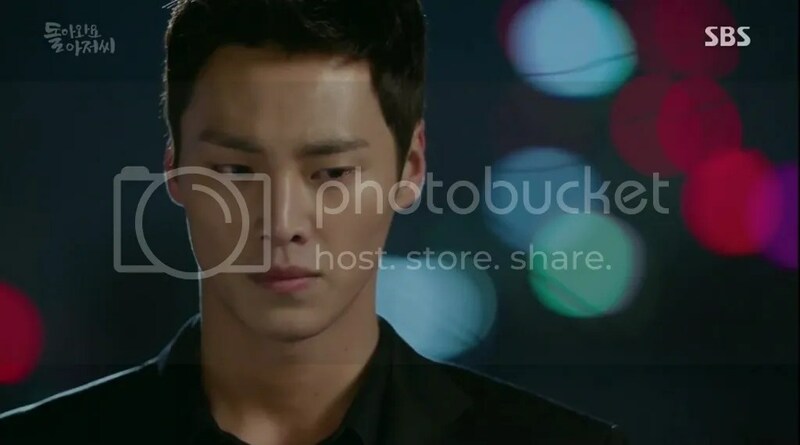 I liked his delivery as both Lee Hae-joon and Kim Young-soo. 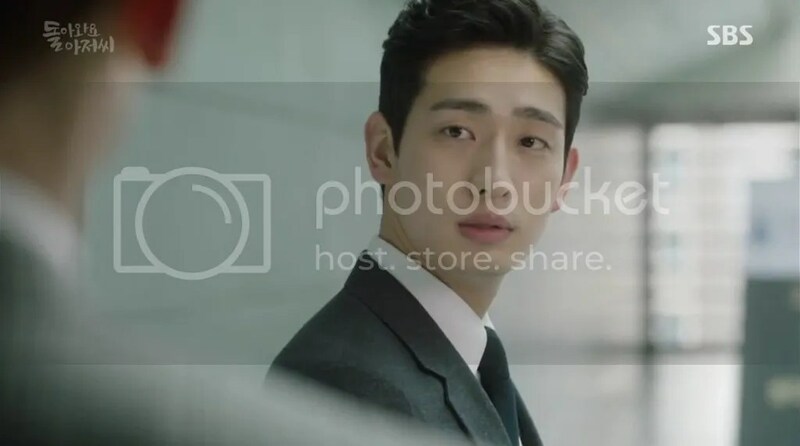 Okay, Kim Young-soo for the most part. In the comedic aspect, he was funny but he totally nailed the sad and emotional parts as well. Seeing how Young-soo had led his life before his death, it made me want to root for him in his second chance at life. The sorrow he felt from leaving his family behind, how much he wanted to stay by their side with all the time he had left and his passion for Sunjin Department Store – all of these were heartwarming and was one of the greatest reasons why Come Back Mister touched my heart, deep down. I keenly felt how much he regretted neglecting his family, namely his wife Da-hye (Lee Min-jung). Even though it was because of work, he couldn’t spend quality time with them in his lifetime. He did his best then, but realised that maybe he didn’t try to understand Da-hye or her needs. And so he’d gone to the extent of all the strange actions just so he could stick with the family but what I really liked was how he reflected on himself every single time and at every turn, he would better himself. As for his job at Sunjin, yes he was a workaholic given that he practically gave his whole life to the store, but later when he came back from the afterlife, Hae-joon was the only sincere store manager amidst all the scheming higher-ups who just wanted to get ahead themselves. I must say he did a favour to the real Hae-joon, making himself and the store worthy of his employees’ and people’s respect. The best part about this is that all these contributions were made not for himself, but for his family and the future of Sunjin. All in all, this character is admirable. I reached this point but forgot to mention the eye candy we got, aka abs. 😛 Thank you Show for allowing us to see it, lol! Before this, Oh Yeon-seo has never wow-ed me in her dramas (last saw her in Medical Top Team) but her role here completely impressed me. Her performance was excellent – I’m glad that this role gave her the opportunity to show more of her acting abilities. Gi-tak was manly, yet she portrayed him to perfection as a woman. The tone of her voice, her mannerisms, behaviour, basically everything! Sometimes she really cracked me up too; I was in awe of her fantastic acting. Hands down to the actress for this. The emotions shown whenever it came to the love of Gi-tak’s life, actress Yi-yeon (Honey Lee) and his minions who worked at the restaurant – she really cared for them like they were family. Most importantly, his loyalty was one quality that stood out, friends and lovers alike. Gi-tak fought for them and it made me think, ah they’re blessed to have him in their lives. 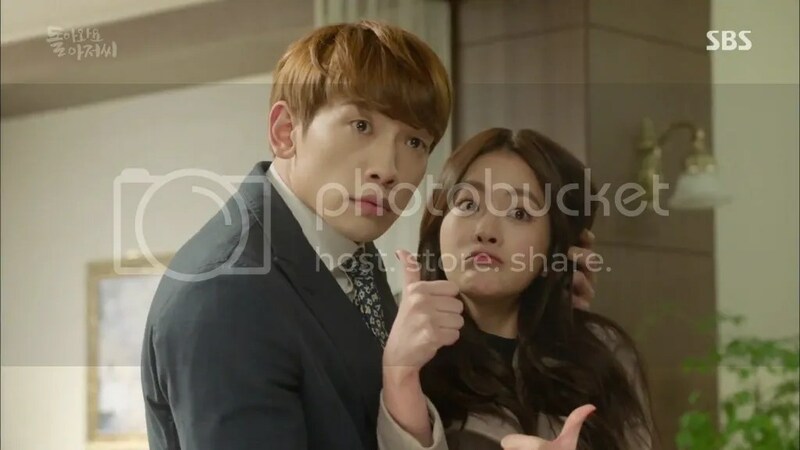 Rain and Oh Yeon-seo had chemistry that was off the charts – it was so amazing even though they were not playing lovers. I really liked the blossoming friendship between these two: from the random conversations to becoming pals in the afterlife. They were the only ones who knew each other’s true selves, and I liked how they confided in each other because they were the only persons to which they didn’t need to hide behind their fake identities. It’s even better that they were black-and-white frank with each other, with no secrets and all-round genuine smiles. I mean, when can you ever find such a nice relationship again?! Even in kdramas. From covering up for each other, helping one another to the serious, sentimental moments; and sometimes that’s also when all things hilarious kick in. In that sense, they helped to heal each other’s heartbreak too. So very precious. I didn’t find it hard to feel for Da-hye, and that must be because Lee Min-jung portrayed the grief of losing her husband really well. But what I really liked was her realization that perhaps Young-soo had loved her more than she’d thought and her choice to continue working at Sunjin after he left. It showed that she loved him too, and besides home Sunjin was the only place where inevitable traces of Young-soo remained. Maybe deep inside, it was her way of dealing with the loss. But she also has a lovely daughter Han-na (Lee Re) and a doting father-in-law No-Gab (Park In Hwan) at home, and it was such a family filled with warmth and love. Sometimes you can’t help but tear up at the closeness and kinship, just like how Hae-joon betrayed his true emotions several times. I especially liked to see how Da-hye’s relationship with Hae-joon evolved over time – from the weird and awkward phase to gradually and unknowingly relying on him. Her feelings couldn’t help but show, and the relationship developed in spite of the small, slow steps it took to get there. The change was subtle but visible and felt. Honey Lee also shone in her role – from Yi-yeon’s pain and hurt to being funny in some scenes, there was a good balance. It was understandable that she didn’t want anybody by her side when her celebrity career hit rock bottom and the antagonists were just trying to pull her down further. She also had to cope with losing the man she loved, but these circumstances definitely made her a better person overall. I liked to see her growth as a character and my favourite part of it was seeing her become a strong and independent woman and certainly, Hong-nan played a big part in it. She was a source of strength and like it did for me, I’m sure Hong-nan was heartened to see Yi-yeon pick herself up again. In a way, Yi-yeon was also Hong-nan’s source of strength – when she’s happy, Gi-tak would be happy too. Choi Won-young can be really good in both funny and villain roles, as we’ve seen in his dramas from last year. As Sunjin’s president baddie this time round, he didn’t disappoint too. His sinister expressions, speech and anger – I just love that I’ve seen so many sides of him in a short time period! And though I know I’m not supposed to laugh as he’s the antagonist, sometimes I just find his facial expressions and actions so funny~ Coupled with the flashy suits/clothing and all, I mostly enjoyed his performance. Character development was done really well in Come Back Mister as a whole, almost all the characters showed growth and by the end they surely became improved individuals. Whether it was understanding the people around them better, or starting to think more for others instead of themselves I think the greatest aspect of it was that they became truly happier people. Like we didn’t need to see it, but we knew they had opened their hearts. Sometimes you just got to let things go 😉 And all our protagonists have something in common: their unwavering love towards the people they treasured and loved with all their hearts. Many things had changed, but we know for sure they loved one another, both then and now. Special mention to Kim In-kwon and Kim Soo-ro who played their parts as the real ahjusshis and made the drama more memorable for me. In the first place, I wouldn’t have been able to relate so well to Young-soo and Gi-tak if not for the way they portrayed the characters in the beginning. A few examples would be Young-soo’s fatigue, his frustration as well as Gi-tak’s loyalty and hesitation with regards to Yi-yeon. I really liked how some scenes overlapped Hong-nan and Hae-joon with their ahjusshi counterparts. At times, it made them funnier and at times, it felt real and connected. Not only the leads made it work, the side characters definitely added a slice of life to Come Back Mister and I just wanted to mention some of my favorites. As the fairy who brought our ahjusshis back down to Earth, she was downright funny but also endearing. She granted the leads with the opportunity to interact with their family and friends all over again and with her magic, even managed to comfort those who were still living. 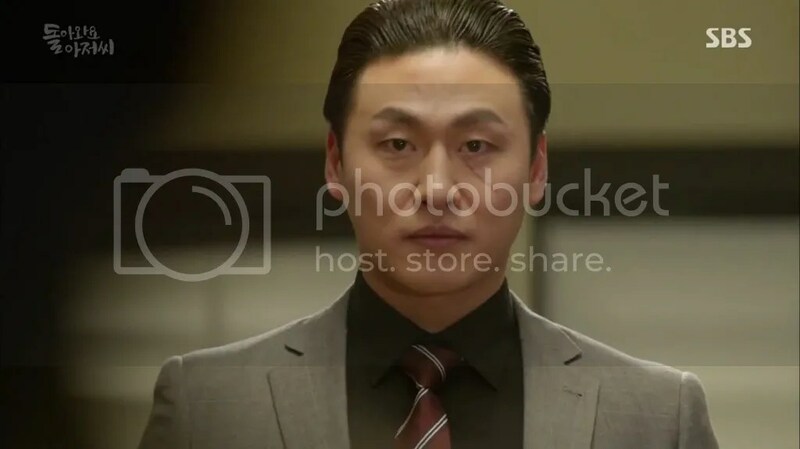 As respect towards his boss/hyungnim, he stayed by Yi-yeon’s side to protect her with those killer moves XD and later the bonding with Hong-nan, which only made me love the drama more ❤ If I’m not wrong, he was the first one who cared for her when she newly came into their lives and also the first to see Gi-tak in her. It was nice to see the importance of Gi-tak in his heart, along with the others. I am so glad Ji-hoon didn’t become like most other annoying second leads. He really cared for Da-hye despite his one-sided feelings for her, but not to the extent where he forced upon being together with her. I also liked how he played a significant part in all our characters’ connections and relationships. My heart literally broke for Han-na when she cried over her father and knowing the truth despite Da-hye’s attempt to hide it from her. And yet, she wanted to preserve the memories with her one and only father. Overall, it was sad but sweet at the same time. For me, some scenes felt incomplete since they ended abruptly before moving on to the next. While I get that they’re trying to explain what was talked about in a scene sometimes, I would have appreciated it if the transitions were smoother before the cuts from scene to scene. Finally before I end, just some overall thoughts. Generally, the cast displayed strong acting although Oh Yeon-seo’s role was the one which stood out the most for me. Still, both Rain and Oh Yeon-seo did a very good job and I was totally convinced that they were the ahjusshis Young-soo and Gi-tak. At first I didn’t think that I would be able to buy the idea because it felt far-fetched but I believed in them in the end. Besides the acting, I think the direction and story probably helped too because of the effort to put in place elements of similarities between both the younger and ahjusshi portrayals. I actually did not feel one bit of disconnection – it’s like Rain’s Hae-joon and Young-soo had become one. The same goes for Hong-nan and Gi-tak. Fascinating! You know how things that seem totally unrelated in the first place slowly click into place and become picture-perfect? That’s how I felt about the plot. Everything just seemed suspicious in the beginning – both Young-soo’s and Gi-tak’s deaths were questionable and I had really hoped that they would solve the mystery. Then slowly but surely, many points started to make sense little by little and it felt like all the question marks in my head disappeared. The direction never faltered, in many aspects. The show really took us for a ride! Despite Please Come Back, Mister’s dismal ratings, it has garnered quite the international fanbase and it is certainly a drama worth giving a try for. It is not without flaws but just the comedy and character interactions is sufficient as the show’s selling point. You may think that the drama is unrealistic and I don’t disagree, but it is still relatable on a human level. I enjoyed this show for what it was – very funny. But the performances were amazing. Rains comedic timing is, as always, impeccable. And his ability to portray subtle, heart-felt emotions and invoke tears is right up there with some of the highest ranked actors in K-ville and Hollywood, imo. Oh Yeon-seo made me believe. lol She is only the second actress to ever make me truly go along with the gender-bender/swap storylines (the first being Yoon Eun-hye in Coffee Prince). Most of that genre I enjoy, but let’s face it, most actresses are too tiny (or too aware of how they might look) to really be convincing. Oh Yeon-Seo also made everyone that had a scene with her shine. Just how do you manage to shine like the sun yet never eclipse those around you? Her chemistry with Rain and Honey Lee had sparks. Even the supporting characters seemed more important when sharing scenes with her. I hope the network reruns this in Korea so that it can get the accolades it deserves but didn’t stand a chance of getting because of its time slot against the much awaited DOTS. Which I also loved. So glad I could watch both and didn’t have to choose. Not just the leads, the rest of the cast really did a great job too! Oh Yeon-seo’s role and performance this time is legendary, lol. It’s so different from a girl pretending to be male. And it’s not easy to portray for an actress. I’m not too sure how reruns work in Korea, but I do hope they won’t forget this drama by the awards season! Haha I’m glad you enjoyed both shows! I’ve seen reruns of shows in Korea mentioned on Dramabeans. Sometimes for this very reason, and other times as fillers as they wait for another show to be ready for broadcast. It doesn’t seem to happen very often, but it does happen. And I’m may glad to be on your email ing list so I can stay abreast and see what others think of shows I’ve watched and sometimes find out about shows I otherwise would’ve let slide by. Ok so now I am going to continue watching this. I have started it and for some reason I got tired and not got hooked. Now I am watching 4 at the same time and for a week now, I totally stopped watching KDrama until I bump into a nice review/recommendation. It really is important for us Kdrama fans to share our thoughts as most of the time we do share one taste in dramas that we watch. Thanks for sharing your thoughts and off I go…will continue this one until the end. Hi sideajg! Yes it took some time for me to warm up to the drama as well, whether in terms of appreciating the story or comedy in it. I got to a slow start too :p Sometimes it’s good not to watch too many dramas at one time since it can be easy to lose the sense of engagement with the show(s). That is true 😉 And you’re welcome, thank you for reading too! I hope it will be worth it for you. This was a great drama, I totally loved it. Perfect pinch of comedy & heartwarmingness.